What is Oatmeal & Aloe Vera Shampoo? 1-800-PetMeds Oatmeal and Aloe Vera Shampoo is a gentle and effective shampoo to help moisturize dry and irritated skin for less flaking and itching. It leaves your pet's skin hydrated and coat soft and shiny. Made in the USA. For the best results, combine 1-800-PetMeds Oatmeal & Aloe Vera Shampoo with our 1-800-PetMeds Oatmeal & Aloe Vera Conditioner. NOTE: Buy the 1-800-PetMeds Oatmeal & Aloe Vera Combo Pack and SAVE! How does Oatmeal & Aloe Vera Shampoo work? Aloe & Oatmeal Shampoo contains oats ground into an extremely fine powder. When your pet is bathed, the oatmeal feels silky, as it coats, moisturizes, softens, and protects your pet's skin. Aloe Vera is used to soothe skin and promote healing. 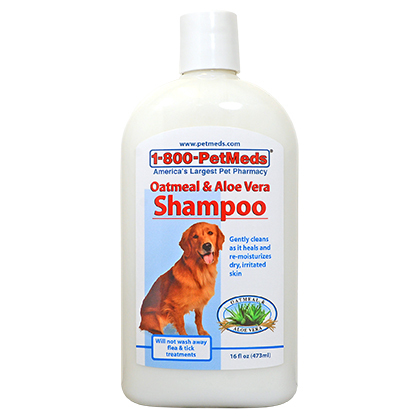 1-800-PetMeds Oatmeal and Aloe Vera Shampoo gently cleans as it heals and re-moisturizes dry and irritated skin. 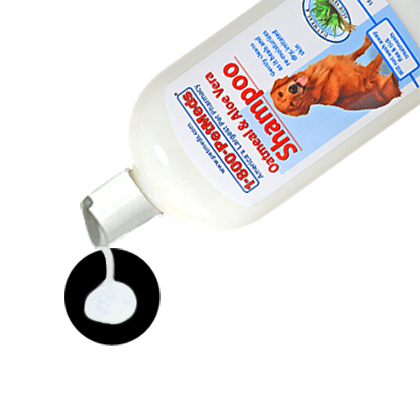 It will not wash away topical flea and tick medications such as Frontline® or Advantage®. 1-800-PetMeds Oatmeal and Aloe Vera Shampoo gently cleans as it heals and re-moisturizes dry, irritated skin. Allow pet to stay indoors until dry. Using warm water, wet pet's coat thoroughly. Avoid contact of soapsuds with eyes. Apply shampoo from tail to head and gently massage deep into coat and skin. Rinse thoroughly. Repeat process. Allow pet to stay indoors until dry. Deionized Water, Sodium Laureth Sulfate, Cocamidopropyl Betaine, Lauramidopropylamine Oxide, Sodium Laurel Sulfate, USP Colloidal Oatmeal, Pure Aloe Vera Gel, Sodium Chloride, Glycol Stearate, DMDM Hydantoin, Tetrasodium EDTA, Citric Acid.